Visit Rufener’s Hilltop Farm for a Fun Fall Festival near Cuyahoga Falls, Ohio! The autumn season is in full-swing in the Tallmadge, Ohio and Cuyahoga Falls, Ohio areas. And Northeast Ohio locals couldn’t be happier! Along with cooler temperatures, beautiful foliage, and a couple of great holidays, fall brings homemade caramel apples and fun fall festivals. 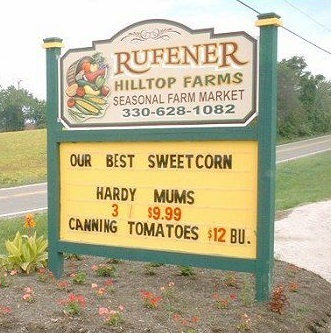 Rufener’s Hilltop Farm near Mogadore, Ohio is especially pleased that fall has arrived to our area, and has planned accordingly. Right now you can visit Rufener’s Hilltop Farm to pick up juicy apples or ripe squash and pumpkins to eat or use in your home decorations. Plus, when you stop out at Rufener’s you can enjoy a cup of their tangy apple cider after going through their elaborate corn maze!